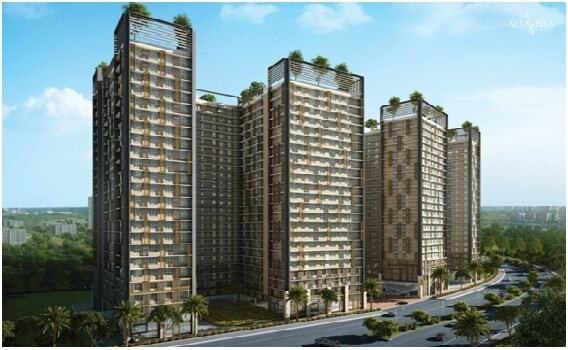 Alta Vista is structured by architect Hafeez Contractor. It is a Joint development by “Spenta Group" and "Sabari Group" of Mumbai, India. The construction is taking place at Chembur East, Mumbai. It has a thoughtful design and is well equipped with all the modern day amenities as well as basic facilities.Alta Vista covers or constructed over 7.6 acres of area with well over 1,000 proposed residential apartments. Alta vista presents 1, 2 & 3 BHK semi-furnished homes with breath-taking mountain views and stunning idyllic landscape views. The configuration of the project varies from 690 to 1582 Square Feetin 86.3 lacs to 1.98 crs. Spenta Corporation has designed Alta Vista project over 7.6 acres with 1K+ homes are set to change the standards of modern day living. Spenta Alta Vista Chembur offers 1 BHK, 2 BHK, 3 BHK apartments sizes between 690 sqft to 1581 sq ft. The 40,000 square feet elevated clubhouse "Viva" area is designed keeping in mind the natural topography and undulation of the underlying land. "Avalon" the 35,000 square feet terrace garden is decorated with greenery meditation cabanas and small water bodies around a jogging track. The development will give the advantage of having community style living while still living in the midst of the city. In recent times Chembur has become the heart of Mumbai's infrastructural development plans. The Eastern Freeway is 5 minutes from AltaVista which connects Chembur to Fort in no more than 20 minutes. The SantacruzChembur Link Road ( 10 minutes from AltaVista) connects Kurla and BKC to Chembur in no more than 10 minutes. The addition of the Mumbai Metro and Monorail projects connectivity to Chembur is now better than ever for daily commuters. The BKC is linked to the Eastern Express Highway. A new Joint Venture - Alta Vista is located at VN Purav Marg, Lal Dongar, Chembur East, Mumbai. Alta Vista by Spenta Corporation is designs a blend of new found luxuries also giving ample of amenities like Swimming pool, Security fire alarm, Rainwater harvesting system, Gymnasium, Club House, Fitness Center, Power back-up facility, Park, proper water supply and many more are available in the area. Schools: - Harrow International Buss School, Tiny Feet playgroup and nursery, Victoria English High School & many more. Restaurants: -Quarter House Bar And Restaurant, Cafe Anil Vikas, Al Safa, Airways Restaurant, Quarter House. Hospitals & Pharmacies: - Jahangir Nasarwanji Wadia Charitable Dispensary, Genesis-Nova Healthcare, SuranaSethia Hospital,Rathore Medical Stores, Sitladevi Medical. Banks/ATMs: - ICICI BANK ATM, Bank Of Baroda ATM, DCB Bank ATM, Bank Of Baroda ATM, DCB Bank ATM. Shopping Malls: -Veena Beena Shopping Center,Phoenix Market City Mumbai,Max Collection, K Stars Mall, Maxus Mall. Airports: -Santacruz Domestic Airport, Chhattarpati Shivaji International Airport.